The Pemberton Valley Lodge is in the heart of adventure recreation country. Pemberton is referred to as the "Gateway to Adventure" and once you have arrived, be prepared. Incredible outdoor adventure is literally at your door step. The Lodge is an all-suite hotel. Choose from Studio, One or Two Bedroom Suites. All come equipped with kitchen or kitchenette and wireless Internet connection. All One and Two Bedroom Suites are appointed with a fireplace, balcony, full kitchen and in-suite laundry. The Studio Suite includes one Queen Size bed. These suites are fully equipped with a kitchenette. Included are a mini-fridge, microwave, toaster, cook top, pots, pans, plates, cooking and eating utensils, coffee maker, complimentary coffee and tea, as well as a seating area. Some of the Studio Suites have a sheltered balcony, while all of them are non-smoking. In addition these suites are equipped with a 27 inch cable TV, DVD player, air-conditioning, clock radio, private bathroom with bathtub and shower, hairdryer, iron and ironing board, direct dial telephone with voice mail and wireless internet access. Easy access to complimentary guest laundry facilities and complimentary indoor/outdoor parking is also included. This unit has the option to connect to a One Bedroom Suite through in-room connected doors. All suites have beautiful Mountain views and sleep a maximum of 2 people. The One Bedroom Suite includes one Queen Size bed in the bedroom and one Double Size Sofa Bed in the living room. These suites are equipped with a fully independent kitchen. Included are a full size refrigerator, dishwasher, microwave, toaster, conventional oven, pots, pans, plates, cooking and eating utensils, coffee maker, complimentary coffee and tea, as well as a seating area and a dining area. All of the One Bedroom Suites have a sheltered balcony, in-suite laundry and are non-smoking. In addition these suites are equipped with a fireplace, 27 inch cable TV in the bedroom as well as the living room, DVD player, air-conditioning, clock radio, private bathroom with bathtub and shower, hairdryer, iron and ironing board, direct dial telephone with voice mail and wireless internet access. Complimentary indoor/outdoor parking is also included. This unit has the option to connect to a Studio Suite through in-room connected doors. All suites have beautiful Mountain views and sleep a maximum of 4 adults. The Two Bedroom Suite includes two Queen Size beds with separate bedrooms and one Double Size Sofa Bed in the living room. These suites are equipped with a fully independent kitchen. Included are a full size refrigerator, dishwasher, microwave, toaster, conventional oven, pots, pans, plates, cooking and eating utensils, coffee maker, complimentary coffee and tea, as well as a seating area and a dining area. All of the Two Bedroom Suites have a sheltered balcony, in-suite laundry and are non-smoking. In addition these suites are equipped with a fireplace, a 27 inch cable TV, air-conditioning, clock radio, private bathroom bathtub and shower, hairdryer, iron and ironing board, separate bedroom with private bathroom, 27 inch TV and DVD player, direct dial telephone with voice mail and wireless internet access. Complimentary indoor/outdoor parking is also included. All suites have Mountain views and sleep a maximum of 6 adults. 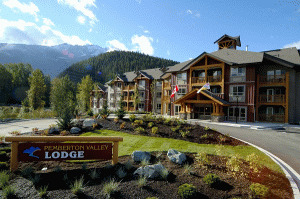 Please visit Pemberton Valley Lodge Website.